The Hinton Theatre was opened in the 1910’s. It was later renamed Orpheum Theatre. It was renamed Ritz Theatre in 1928. It was the grandest of all the local theatres. If it was a “big” movie, then it played at the Ritz Theatre. The theatre was Muskogee’s oldest and was managed and operated by the Proctor and Marsh Company. It closed in the early-1970’s and was demolished in 1977. Proctor and Marsh operated all the Muskogee theatres at one time. In 1970 while attending college in Warner, OK, the group I ran with regularly went to see movies at the Muskogee Ritz, a grand theater indeed. The lobby was four stories high, with three clover shaped mezzanine balconies overlooking the main floor, topped by a fancy clover shaped dome. The auditorium was most ornate, and also had a massive round dome overhead. Stage drapery appeared to be original, heavy emerald green valour, with dozens of gigantic gold tassels running along the bottom portion of the curtains. Valances formed graceful scallops with heavy gold fringe. It was a sad day when I learned that this lovely theatre had been razed. This theater opened in the teens as the Hinton Theater. It featured touring stage shows, magicians and musicians. It was later bought by Fred Turner and the name was changed to the Orpheum. In 1925, it was sold to George Proctor and Hugh Marsh and the name was again changed to the Ritz. It operated as a vaudeville house until 1928 when it was equipped to show talkies. The legendary Tom Mix visited the theater in 1929. Due to style similarities this theatre was probably designed by famed architect Joseph Foucart who migrated in 1889 to Indian Territory from Paris, France. Foucart created Brooks Opera House, Guthrie, OK.
Vintage postcard views can be seen on this fun site. 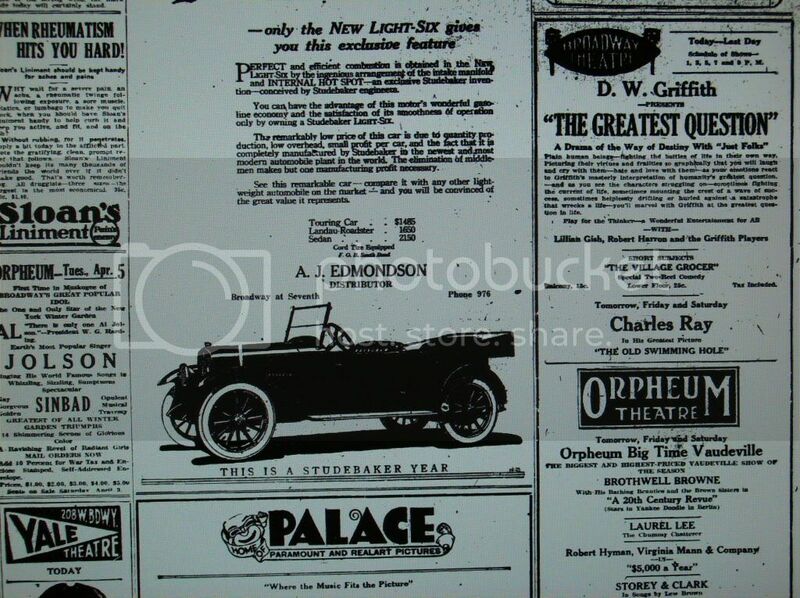 This article from the Muskogee Phoenix says that the Hinton Theatre was built in 1905, was renamed the Orpheum in 1920. It doesn’t give the year the name Ritz was adopted, but it must have been by 1929, as the article says that Procter and Marsh, who renamed the house after taking it over and remodeling, introduced talking pictures at the Ritz. The name Ritz was definitely in use by February, 1930, when it was mentioned in a newspaper item. The house was still called the Orpheum at least as late as January, 1928, when a production of Phillip Duning and George Abbott’s play Broadway was mounted there by the authors. The Library of Congress has a copy of the program for the production, but it hasn’t been digitized. The 1929 edition of The Film Daily Yearbook included the Ritz in Muskogee in its list of new theaters for 1928, so that must be the year the name was changed.